Wow, demand for Eclipse Glasses totally out-paced our expectations! Being a small, new office, we initially just ordered a relatively small amount to start with, because we thought a few people may be interested, and we wanted to make sure to help them protect their eyes from damage while enjoying the Great American Eclipse experience here in Nebraska. Since then, we've reordered several times! Now, we have run up to the time limit in which we cannot get any more here in time to deliver before the Eclispe on Monday the 21st. We hope you enjoy the Eclipse and keep your eyes safe! Never Fear, We Still Have Back-to-School Savings! I know, it's not quite the same, however we just thought we'd remind you that we have great back-to-school savings right now on kids glasses. If you didn't receive our post-card in the mail it is included below. 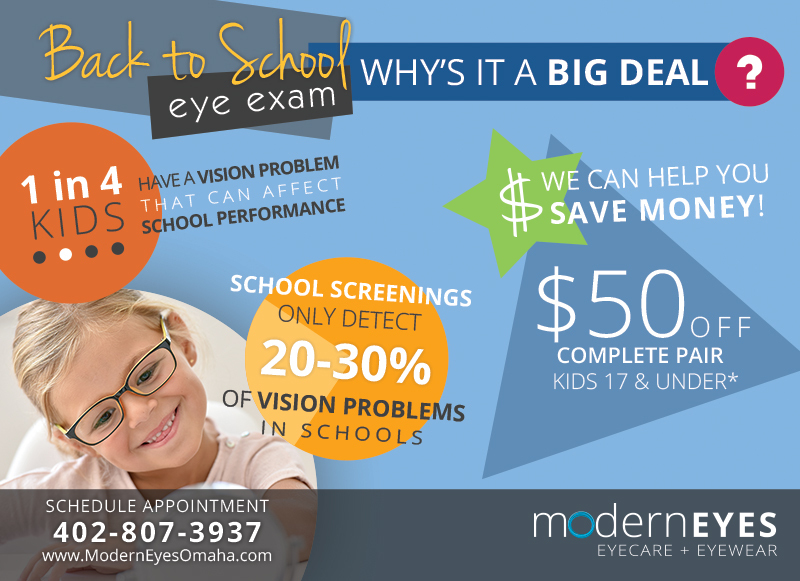 We believe strongly in every child having a regular eye exam, because it can be critical for success in school. 1 in 4 kids have a vision problem that can affect school performance, and we really want to minimize the number of these that go undetected. Another troubling statistic is that vision screenings (rather than a comprehensive exam) only detect 20-30% of vision problems, because many issues can be subtle but still troublesome. That's why we're here, to partner with parents in helping their kids to be prepared for school and live up to their full potential! * Some restrictions may apply, please call or stop in for more details. 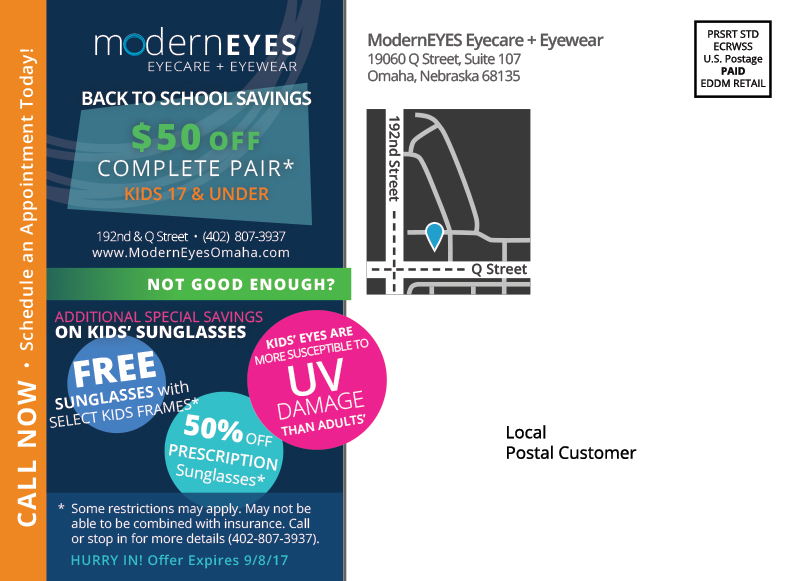 These deals are available until September 8th, 2017, so even though school has started at many Omaha area schools, you are not too late to save some money on glasses!